Dimensions: 54" x 75" x 16"
When it comes to your college bedding, there is one thing all of the Full sized bedding pieces should have in common, they should all be easily machine washable. There won't be much room in your college dorm room, so you'll most likely be spending a lot of time on or around your Full size bed. If this is the case, accidents are bound to happen and, when they do, you probably don't want the college's Full mattress in the line of fire. This is why protective Full bedding is crucial when you go off to college! Our 100% Cotton Fill - All Around Cotton Full Mattress Pad will create an extra layer between your Full sized mattress and the outside world and can be easily machine washable in case any spills happen in your dorm room. Even though it works to add an extra layer of security to your Full sized bed, there is more to this essential dorm bedding item. 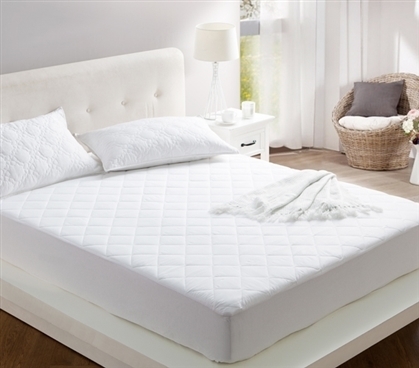 College mattress pads are made to provide you with extra comfort on your Full bed, and this one is no exception! Made with 100% cotton inside and out, this one of a kind Full dorm room mattress pad will give you an extra layer of comfort. Providing comfort and security to you and your college mattress makes this Full mattress pad a highly essential dorm item!